It isn't often I feel proud to see a company step up to the plate for the right reasons. 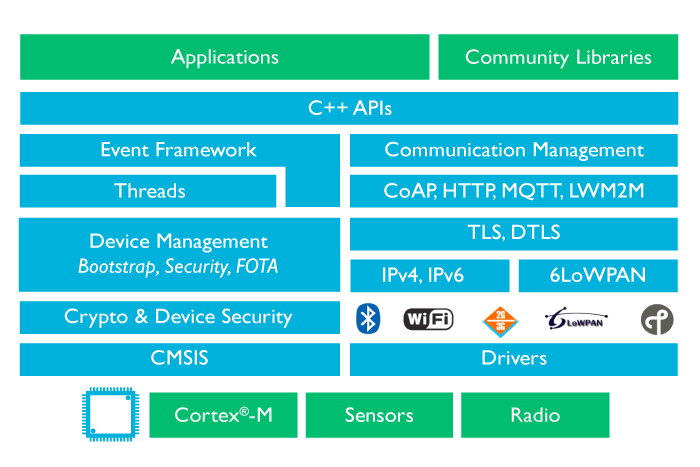 ARM announced a new roadmap for the mbed OS and associated mbed Device Server in a recent press release that is specifically targeted for the Internet of Things. It is built around open standards and aims to bring protocols, security and standards-based manageability into one integrated solution optimized for energy and cost-constrained devices. mbed OS is a modern full-stack operating system, designed specifically for ARM® Cortex®-M-based MCUs; the worlds leading 32-bit micro-controllers that already sell in the billions. Today's IoT devices largely exist in isolation and it has been impossible to realize a truly interconnected world where devices are interoperable with many different cloud services," .. "The ARM mbed IoT Device Platform will solve this by providing a common communication and management toolkit that can be used for a wide variety of purposes. We expect mbed to significantly speed up the large scale deployment of a new breed of both IoT devices and cloud services." source: Krisztian Flautner, general manager, IoT business, ARM. mbed OS is built on top of an open source development methodology with a modular approach so that developers can pick and choose what they need - either a complete operating system or even just take code snippets for integration. The mbed Device Server is a license-able product - obviously providing more a software as a service (SaaS) to enable easy gathering and publishing of information gathered in the IoT ecosystem for integration into additional services and/or for display on mobile devices. This is a great move to build a platform which developers can pick and choose exactly what they need without having to take the alternative "lazy" approach of simply slapping a Linux kernel onto an IoT device - which as many of my blog readers will understand I am not exactly fond of, barebones will always be more secure. As other consortiums compete with each other to figure out how IoT devices will inter-operate with each other - mbed OS can provide a comprehensive set of underlying support code. The plan is to deliver by October 2014 - however with community support it could be sooner.